The New York Giants were a refurbished club as they commenced a new NFL season against the Steelers at Pittsburgh on September 17, 1950. Head Coach Steve Owen was back for a 20th year and the Giants had gone 6-6 in ’49 following two losing records. With the demise of the rival All-America Football Conference, New York had picked up some key players from the AAFC’s Yankees, including DT Arnie Weinmeister (pictured at right) and defensive backs Otto Schnellbacher, Tom Landry, and Harmon Rowe. Rookie FB Eddie Price joined HB Gene “Choo-Choo” Roberts in the backfield while QB Charlie Conerly was back for a third season. The Steelers were coached by John Michelosen, entering his third year, and remained the NFL’s last holdout in running a single-wing offense. 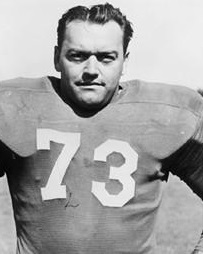 With Joe Geri typically lining up at tailback, Pittsburgh was a low-scoring, ground oriented team, and it was thanks to a strong defense that the Steelers had accumulated a 6-5-1 record in 1949. There were 24,699 fans at Forbes Field for the season-opening contest, and they saw a scoreless first quarter. While the Steelers couldn’t move offensively, a 74-yard quick kick pinned the Giants back at their 10. Early in the second quarter, the Steelers got their initial first down of the game on a pass by tailback Bob Gage to end Charlie Mehelich. The possession amounted to nothing, and the Giants missed out on a score when Ray Poole’s field goal attempt from 40 yards fell short. Inside the last two minutes of the first half, a long pass by Charlie Conerly was intercepted by DHB Howard Hartley, running at full stride. He was pushed into the end zone by Gene Roberts, and it was ruled that Hartley had caught the ball on the field of play before crossing the goal line. Thus, the Giants picked up a safety despite giving up an interception. New York led by 2-0 at halftime as both offenses were stymied. The Steelers, in particular, managed only one first down in the first half. Pittsburgh started the third quarter off with a promising drive that reached the New York 29 in six plays, but a fumble by FB Fran Rogel was recovered by safety Otto Schnellbacher to snuff out the threat. The Steelers made out better on their next series, advancing 65 yards in seven plays. 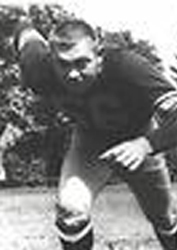 A short third down pass by tailback Tom “Shorty” McWilliams was caught by Rogel, who gained 63 yards to the New York two. The Giants stiffened on defense and it took four tries before FB Jerry Shipkey (pictured at left) finally penetrated the end zone for a touchdown. Joe Geri added the extra point and the score stood at 7-2 heading into the fourth quarter. It looked bad for the home team when Gage fumbled and the Giants recovered at the Pittsburgh six. But the Steelers came through with a goal line stand and the visitors came up short at the one foot line, turning the ball over on downs. However McWilliams, back in punt formation from his own end zone during the ensuing series, was supposed to fake the kick and run to his right, but the snap sailed past him and over the end line for another safety. Pittsburgh’s lead was narrowed to 7-4 with 12 minutes remaining to play. Once again the Steelers turned the ball over as DT Arnie Weinmeister recovered a fumble by HB Jerry Nuzum at the Pittsburgh six. And once again the defense kept the Giants out of the end zone, with the Steelers regaining possession on downs at their one. Once more the home team was forced to punt from its own end zone, with a limping Joe Geri back deep, but he muffed the snap and DT Al DeRogatis recovered for the Giants for a touchdown. Poole kicked the extra point and New York was back on top by a score of 11-7. The Steelers went to the air in response as tailback Jim Finks completed two first-down passes to end Elbie Nickel. But another pass by Finks was intercepted by DHB Harmon Rowe, who fumbled after returning it 32 yards, and while OT Frank Wydo recovered for the Steelers, he fumbled in turn. DE Ray Poole recovered for the Giants and lateraled to safety Tom Landry (pictured at right), who ran 37-yards for a touchdown to complete the odd sequence. Poole added the point after and, with less than a minute remaining in the contest, the game was clinched for New York, which won by a final score of 18-7. Total yards were nearly even in the defensive struggle, with the Steelers holding a 198 to 197 edge, and each team accumulated 10 first downs apiece. The Giants were more effective running the ball, with 167 yards to Pittsburgh’s 34, but Charlie Conerly completed only three of 13 passes for 30 yards as he faced a steady rush from Pittsburgh’s defense. New York recorded seven sacks, to none by the Steelers, and Pittsburgh also turned the ball over a staggering nine times, to two suffered by the visitors, with six coming on a total of seven fumbles. The Giants won their next two games before losing to the Steelers in the rematch in New York, but they lost only one more game on the way to a 10-2 record that tied them for first in the American Conference with Cleveland. However, after defeating the Browns twice during the regular season (making them the one team that appeared to have solved the juggernaut that came to the NFL from the AAFC), New York lost in the Divisional playoff. Pittsburgh continued to have problems putting points on the board and was the league’s lowest-scoring team, although again the rugged defense allowed the club to remain competitive. The Steelers broke even at 6-6 to finish in a third place tie in the conference with Philadelphia.